Dimensions 1.25 by 10.25 by 12.50 in. Why do some countries grow and others do not? The authors of The Atlas of Economic Complexity offer readers an explanation based on "Economic Complexity," a measure of a society's productive knowledge. Prosperous societies are those that have the knowledge to make a larger variety of more complex products. The Atlas of Economic Complexity attempts to measure the amount of productive knowledge countries hold and how they can move to accumulate more of it by making more complex products. Through the graphical representation of the "Product Space," the authors are able to identify each country's "adjacent possible," or potential new products, making it easier to find paths to economic diversification and growth. In addition, they argue that a country's economic complexity and its position in the product space are better predictors of economic growth than many other well-known development indicators, including measures of competitiveness, governance, finance, and schooling. Using innovative visualizations, the book locates each country in the product space, provides complexity and growth potential rankings for 128 countries, and offers individual country pages with detailed information about a country's current capabilities and its diversification options. 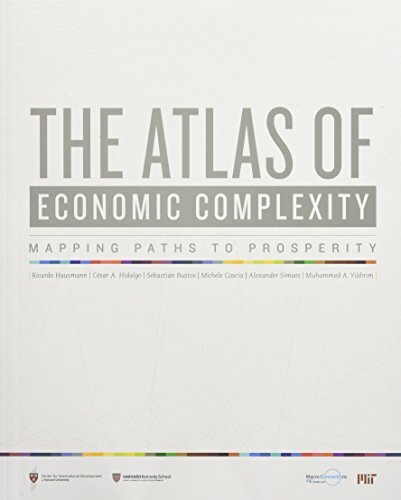 The maps and visualizations included in the Atlas can be used to find more viable paths to greater productive knowledge and prosperity. About: Maps capture data expressing the economic complexity of countries from Albania to Zimbabwe, offering current economic measures and as well as a guide to achieving prosperityWhy do some countries grow and others do not?